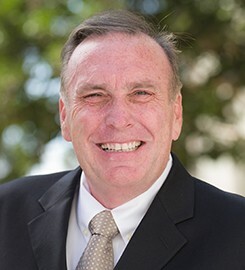 Richard E. Custin exercises a practical approach to teaching based upon his experience as owner and manager of a law office, mediator and as a litigation attorney. Custin is a member of the California Bar Association and the American Association for Justice (AAJ). He was also appointed to a judge pro-tem assignment in Los Angeles, California. He served as a judicial law clerk in the Iowa District Court and was the recipient of the Hathaway Kemper Insurance Law Fellowship. Custin holds active bar memberships in California and Illinois. He is further admitted to practice law before the District of Columbia Court of Appeals, The United States Court of Federal Claims, The United States Court of Appeals For The Ninth Circuit and United States District Courts for the Northern District of Illinois, Central District of California and Southern District of California. In 2016, he was appointed an affiliate professor of the Joan B. Kroc School of Peace Studies. Dalton, T., Custin, R., Barkacs, L. (2011) Debt Cancellation in the Age of Mortgage Foreclosures, Real Estate Taxation, 38(3), 100:104. Dalton, T., Custin, R. (2016) Social Security: Projecting The Optimal Collection Age In An Era of Low Investment Returns, Practical Tax Strategies / Thomson Reuters, 4(October). Custin, R., O'Connor-Ratcliff, M., Ratcliff, R. (2013) The Mensing Conundrum: Litigating Generic Drug Injuries in California (Featured Article), California Business Practice(2), http://www.calpractice.co. Custin, R., Tehrani, S. (2012) The Golden Standard? California as a Model for National Medical Malpractice Tort Reform, Journal of Law, Business & Ethics, 18, Custin, Richard E. and Te. Submit changes to Richard Custin's profile.